I know I seem to mention the weather a lot lately but I'm English that's what we do ;) Hasn't it been hideous though, rain that wets you (iykwim), and misty foggy stuff that means you can't see a metre in front of you - vile and I hate to say it but it's only going to get worse - in fact one weather report I saw on Sunday mentioned the potential for wintry showers on Friday - NOOOOO! Whether (haha) we like it or not it's going to get colder before it starts getting warmer again, and nothing suffers more than anything our skin. Although I have combination skin on my face as well as my body, I'm already starting to see a few dry patches on my legs and my hands. A survey carried out in the UK in 2011 by Nelsons, the UK's largest manufacturer of natural health care products revealed that around 1/3 of women suffer from dry hands, just from daily activities such as washing up and housework. That's a lot of women, but throw cold, wet weather and central heating into the mix, and I imagine that an awful lot more of us will suffer from dry, sore hands. I was recently a product by Nelsons from their Skin Range which promises to soothe and moisturise those dry bits away, not just on our hands but also on our face and body. 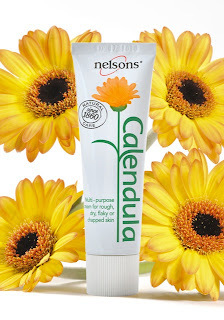 Nelsons Calendula Cream is a paraben free cream, containing glycerin, Shea butter, beeswax, and of 100% natural Calendula extract. Calendula is probably better known as the marigold, you can see how beautiful these flowers are the picture above. They aren't just a pretty flower though pharmacy studies have found that the plant contains anti-viral, and anti-inflammatory properties which make it ideal for treating sore and irritated skin. I don't know if you remember but I have mentioned a few time that my dad suffered from quite severe psoriasis,and one of the treatments that he was given by a herbalist and that he found some relief with, contained Calendula. That's high praise indeed because he had to be really careful what he used on his skin. The cream comes boxed, and is packaged in a metal, paint style tube. The product is complete airtight until you pierce through the lid with the lid. The texture of the cream surprised me, thinking back to the ointment my dad used I was expecting something quite waxy, and quite thick but this was anything but. It.s white in colour and has a smooth creamy texture. Again my previous views on products like this were overturned, I was expecting this to be hard to rub in and to feel quite greasy but it was smooth and creamy and it really absorbed quite quickly with only a tiny bit of tackiness. I've been predominantly using this cream on my hands and on my feet, but I've also popped it onto a dry patch on the back of my left thigh and I definitely think it's made a difference. The dry patches on the sides of my fingers have all but gone, my feet don't look or feel as dry, and the patch of skin on the back of my thigh doesn't feel nearly as rough as it did. Don't forget this cream can also be used on the face too, I don't have any dry patches at the moment but I do sometimes get them around my eyebrows and my forehead so I'll definitely by giving this a go on my face when the weather gets even colder. This is a great cream if you have dry, sore or irritated skin, and you don't like anything to heavy or too greasy on your skin but that said I'm not sure I would repurchase why? well the smell. I guess the smell of this product proves how natural this product is, because all you can smell is marigolds. My mum grows marigolds in the garden on occasions, and whilst they are a beautiful colourful flower, they don't smell that great. It's not a horrible smell by any means just quite plant and herbal based so I'm going to persevere with this product for the foreseeable future and I hope I can get used to the smell. Nelsons Calendula Cream comes in a 30g tube which retails at around £4.65 and in a 50g tube which retails for around £6.35. It's available from Boots, Holland and Barrett and several independent health food stores and pharmacies. For more information and to find your local stockist please check out Nelsons official website.